Adobo sa Asin, Adobong Baboy sa Asin. 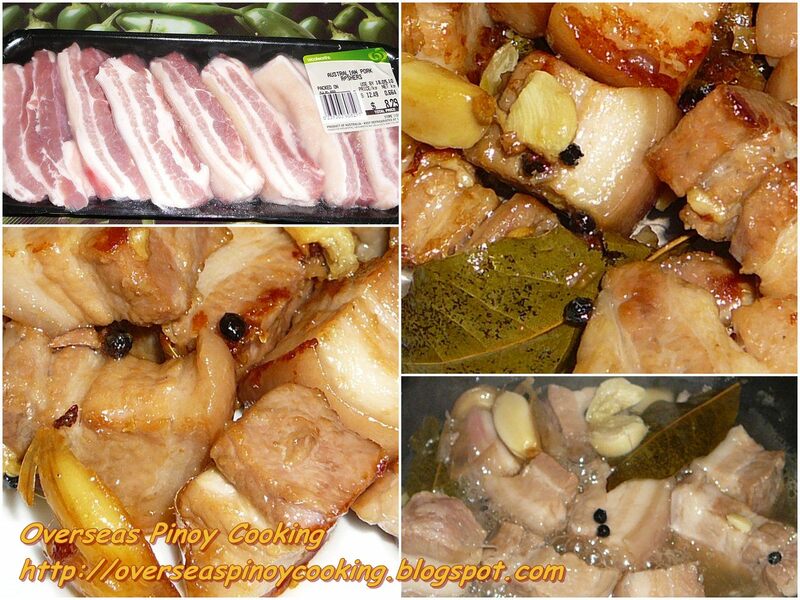 This is my second version of this adobo dish. The first was simply called adobong puti. Cooking procedure of both are similar, on the first dish it was a mixture of chicken and pork. Both versions are cooked adobo with out soy sauce. I have to post this request in response to some readers query on how to cook adobo sa asin. This is best served a day after with chopped tomato and onion with fish sauce and a lot of rice. In a sauce pan place pork, pour 2 cups of water. Add in vinegar, garlic, peppercorns and bay leaf and salt bring to a boil and simmer at medium to low heat for 20 to 30 minutes add more water if required. Correct saltiness according to taste, When the pork are tender continue to simmer until all the liquid has evaporated and pork start to render fat. Now cook the pork on its own fat until brown on low heat turning occasionally to avoid burning the bottom. Best serve a day after with a lot of rice. I love adobong puti! My mom's recipe is almost exactly the same as yours except my mom adds smashed lemon grass (tanglad) and fish sauce (patis). I haven't eaten this for years and now that I've read your post, I'm really missing it. The secret of this adobo version is its simplicity, thanks Chowhound for dropping by. This variation of adobo tastes superb. my mom used to cook this dish and it can be stored inside a glass jar in large quantities for almost a week without being put in a ref. Useful during typhoon season where blackouts are prevalent. this is new to me, but it taste delicious. tnx for the recipe. kudos.